Join our Newsletter to get news on the upcoming iOS and Android versions of Picma! Uncover hidden pictures using your logic skills in a game featuring thousands of puzzles across 3 different game modes! Since 2009 our community has created over 35 thousand unique puzzles, with more added every week! Earn Coins and unlock new puzzles by creating your own or by voting daily on those of others. Your Subscription's clock ticks once per month. Stop playing and the clock stops counting, keeping any remaining months on hold until you return. Solved puzzles are permanently added to your account and you can replay them for free whenever you want. 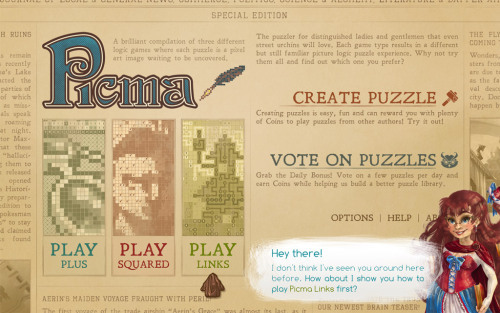 Picma is a compilation of 3 different logic games where each puzzle is a pixel art image waiting to be uncovered. Don't worry if these rules seem complex, if you try the Tutorials they will quickly make sense! Each clue indicates a group of contiguous cells filled with the same colour in a given row or column. There must be at least one empty cell between groups of the same colour, while groups of different colours do not necessarily have empty cells between them. Clues are always given in the correct order. Each clue indicates how many of the 9 surrounding cells, including itself, must be filled with the current colour. A cell that contains a clue is either empty or filled with that same colour. Clues always appear in pairs that you must connect. The numeric value of each clue indicates the length of the path that connects the pair. Left-click or left-click and drag to “paint” cells with the current colour. Right-click to cross empty cells. F Enables Fullscreen mode. Press “F” again or “Esc” to exit. 1 Selects the “cross” to mark empty cells. 2-8 Switches to the corresponding colour. Z, X Cycle through all available colours as well as the “cross”. Spacebar Pops up a small palette under your mouse cursor. Shift Holding “Shift” allows crossing cells without changing colours. Ctrl Holding “Ctrl” will allow you to click and drag the grid. W, A, S, D Respectively moves the grid up, left, down and right. Q, E Respectively Zoom Out and Zoom In. Voting daily usually takes just a couple of minutes and allows you to help build a better puzzle library while also earning enough Coins to play a new puzzle everyday! The most important guideline is also the simplest. Just don your art critic hat and say Yes to images you find pleasing. Try to be a harsh but fair critic! The bigger the canvas the more room there is to make something great, therefore you should be exceptionally critical of large images that are far too simple or uninteresting. Given that most flags would fall under this guideline, and in order to be impartial, country flags should not be accepted. A name can often make or break a puzzle, particularly for smaller images. Consider the image's title before casting your vote. Picma's community is global and encompasses several generations of puzzlers with varied beliefs and life experiences. Be on the lookout for hateful images, as well as those with obscene, political or missionary messages. Creating puzzles is an easy and fun way to earn Coins to play puzzles from other authors! You should however expect a period of at least 72h between submitting your creation and receiving any Coins due to the community voting process. Press the "Create Puzzle" button and start drawing! It's really easier than you might think, but please keep the Voting Guidelines in mind. Finished? Name your image and press the “Validate” button. The editor will then check if valid puzzles can be made using your image and will present you with the results in about 30 seconds. Happy with the results? Press the “Submit” button (or go back and tweak it further). Creating images that "validate" is not an exact science, but practise makes perfect. Done! Other players will now be able to vote on your creation. Receive enough positive votes and your image will be one step away from becoming a puzzle. Accepted images are then checked against duplicates (and guideline violations that voters may have missed). Finally, they are turned into puzzles and you receive your hard-earned Coins. In the "Authors" tab of each game type you will find your username and an indication of how many puzzles you still have in moderation. When an image of yours becomes a puzzle it will also appear there. Is your question is not answered below? Feel free to get in touch! Why can't I play my own puzzles while they are in moderation? Unfortunately at that point the "puzzles" are just images. The validation tool in the editor only attempts to check if a puzzle can be made. The actual puzzle creation is a very resource-intensive process that can take several hours to complete for a single large puzzle. I submitted several images and I now have "0 puzzles in moderation". What happened? In most cases this means the community hasn't given your images enough positive votes. Please don't feel down! As long as you follow the Guidelines you will soon start seeing your images being turned into puzzles! Why was my image changed? Now and then we find a great image that wouldn't result in a fun puzzle. When this happens we try to tweak it (often by adding or removing a background) in order to create a better puzzle. If at all possible we'll try to have it validate for the same game types as the original. I had completed several Archives but now some of puzzles show up as incomplete. Why? Whenever near-duplicate puzzles are found and removed the Archives need to be re-arranged in order not to have any "holes" in them. So while it may look as if we forgot some of the puzzles you solved, rest assured the "incomplete" puzzles are actually new. Follow us on Tumblr, Twitter or Facebook for more news on what we have been up to! With that out of the way… Yikes! Our last post on this blog dates from 2015! We’re back! Or at least this blog is. We were always here, keeping Picma (mostly) working throughout the years. Sadly, we couldn’t do much more than that, and the development of a new Picma eventually ground to a halt. That is, until now. We’re once more working full-time on Picma and this dev blog will be getting much more regular updates! That’s not all though. We needed a better way to connect with you, our community, so we went back to the basics and created a newsletter. Major announcements will be posted here as well, but a few things like early access and surveys will be exclusive to the newsletter. Please consider joining and helping us make the best Picma ever! While Isabel has been busy working on the internals of the tablet version Ive been trying to fine-tune a few visual elements and improve the initial experience for new players. Ophelia will soon notice any new faces in the Golden Cog Inn and offer to help them learn Picma Links (although shell also happily teach you how to play Plus or Squared). Nowadays it seems that everything is in the “cloud” somewhere. It’s so ubiquitous that it doesnt sound like such a big deal any more. Even so, were thrilled to have Picma join that not-so-exclusive club - not only because its a really useful feature but also because it was quite an engineering hurdle for a team of two. Copyright © Moonberry Studios, Lda. All Rights Reserved.